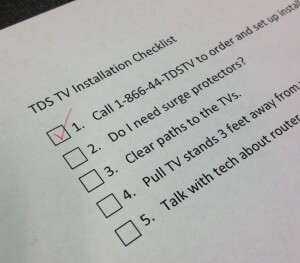 One question a lot of people have asked me when contemplating adding TDS TV to their home, is how bad is the installation process? It can be daunting just thinking about all the hassle that may occur. While I cannot guarantee your install will be 100% trouble free, I can promise TDS will do their best to make your experience as pleasant as possible. I’ll outline a couple things, and give you examples of how my experience went. In terms of prep work, there isn’t much you need to do, but there are a few things that can make your install go that much easier (and maybe even faster). 1. When you call in, you’ll set up an installation time that starts either in the morning, or the afternoon. The process takes about 4 hours. I work from home one day a week anyway, so that was no problem for me. I lucked out—my appointment was slated for an a.m. start time and the TDS Technician showed up promptly at 8:00. My home was already wired in all the rooms with newer coaxial cable and Cat5 cable, so that part saved quite a bit of time. It took roughly an hour to complete all the work on the box mounted on the exterior of the home, and then 1.5 to 2 hours on the inside. That includes a complete installation—meaning, all my TVs were set up with the boxes I desired, the Internet was up and working, phone was up and working, and all the remotes were programmed before the tech left. I even got a nice “how to” tutorial with handy tips and tricks for my new system. It should be noted that in certain homes, sometimes drilling into the walls needs to occur if you don’t opt for wireless set-top boxes. This is an effort to get at older wire that may not be working the best or support TDS TVs all-digital service and replace it with new stuff. Drilling is typically a last resort (and again, avoidable if you get wireless boxes), and TDS will always ask for your permission before doing so. 2. I always prefer to tidy up my home before people come by. This means I’ll make sure the laundry is put away and do a quick cleanup, which I’m sure techs (and my mother-in-law) appreciate. Oh, and the techs will help keep your house clean by slipping on shoe covers when they come in the door. 3. You’ll want to take a quick run around the house where all your TVs are. Make sure they are working, and make sure whatever your TVs are sitting on (stands or entertainment centers) are pulled three feet or so from the wall. Access to the wall and cords/cables is key…and the techs don’t want to scratch your nice hardwood floors. 4. Think about whether you need any surge protectors/power strips. If you think you’ll need one to plug in a set-top box in addition to everything else you have on that outlet, you can always pick those up in advance for a couple bucks on Amazon or your local Target-type store. The techs should have some on hand if need be, but if you get your own then you’ll get the kind you like and that you know will protect your equipment. While this isn’t really about preparing for your installation, I would encourage you to ask questions along the way to make sure you feel comfortable with what’s happening and how to use the product before the technicians leave. Don’t hesitate to watch where things are being installed, and where new cables or boxes are running. If you have troubles later on, that knowledge could come in handy. Also, don’t be afraid to talk with your TDS Technician about where you think the new modem or wireless access point (should you choose to get wireless boxes) should go. Frequently these items have location flexibility, and you know your home better than anyone. For example, sometimes you know the best, centralized spot to locate your router to get Wi-Fi in the whole home. That said, the router location will be dependent on where it can be hardwired and connect to other devices. All in all, the installation process goes faster than you think, and leaves you ready to watch TV. If you have any questions in advance, you can always call our TDS team to alleviate any concerns you have. You can also comment on the blog, and I’ll get back to you ASAP.